Completely wire-free earbuds are a spectacle. They are entirely separate, and with minimum limitations when compared to their wired cousins. Being wireless gives them more possibilities when it comes to integrating with virtual assistants and music control apps. Wireless earbuds that come with a neck cord also count in this category. They ditch tangled cables so that you can live a wire-free life. 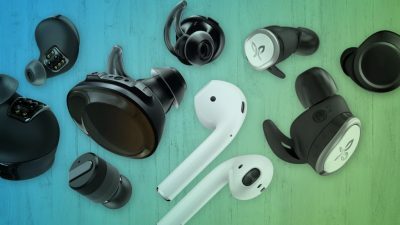 Today, wireless earbuds are the in-thing, and we are not leaving in anything out as we review the best truly wireless and wireless earbuds. Apple Airpods are more than just a piece for listening to music. Some people may say they are overrated but if you are looking for truly wireless earbuds for your iPhone 8 or iPhone X they may be just what you are looking for. AirPods have a charging case that will not just charge the earbuds once. You will get up to five hours of listening time on a full charge. And when you have a low battery, 15 minutes of charging them in the case will give you three hours of listening time. One of the exciting features of AirPods is the seamless connection. Instead of searching for Bluetooth pairing, the earbuds automatically connect to your iPhone so that you can start listening to music right away. You just need to tap on your iPhone the first time you use them, and from then you will not need any more pairing. Apple AirPods are truly wireless. They are a bit longer than regular earbuds seeing that they house a W1 chip and a mic for receiving calls. The earbuds come with a motion accelerometer and an optical sensor to detect when they are in your ears. The earbuds will pause when you take them out so you won’t be dealing with any buttons. They require integration with Siri to control your music playback. To activate Siri, you just need to tap on one of the Airpods to receive a call, adjust the volume, ask for directions, or change the song. Apple is introducing Airpods 2 that will not require tapping on the Airpods to activate Siri. Instead, you will be using a “Hey Siri” command. Apple Airpods are not that great if you are an audiophile looking for ear blasting bass. We give them an okay performance because the sound does not distort until when playing at the highest volume. We do, however, like that they have dual beamforming microphones that filter out the noise so you can hear and be heard clearly. Airpods fitting can be a bit tricky for most people. You will need to see that they are a good fit before you decide they are for you. Some users have reported that they easily fall off just by a little shaking of the head which happens if they do not fit your ears. They also do not have good sound isolation as you will notice when running with them. 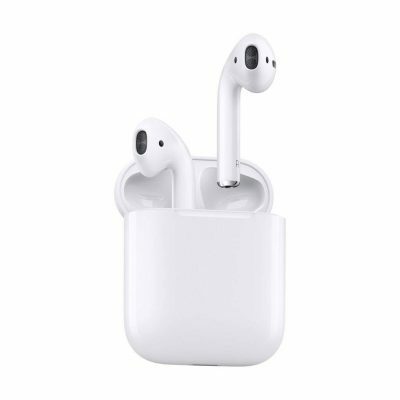 Apple Airpods are fully wireless earbuds that bring in the convenience of going without cables. They are easy to pair and work with Siri for easy control. You get to pick calls with them, and they can pair with Apple devices including Apple Watch, Mac, or iPad. 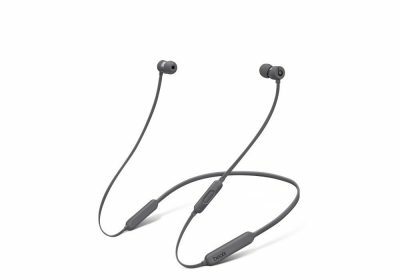 The Jabra Elite 65t is regarded as a much better fit than the AirPods in terms of sound quality and fit. But their price is much higher than the AirPods. 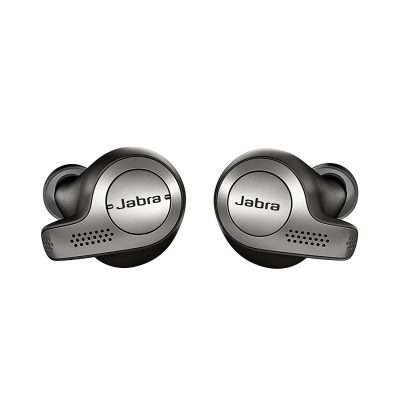 With the Jabra Elite 65t, you will like the subtle design as they do not stick out from the ears. They come with silicone ear tips in three sizes so that you can use the ones that fit in your ears. Silicone is comfortable, and it also acts great in isolating sound that’s why they sound much better than earbuds in their class. These earbuds will come in a charging case. You just have to pop them in your ears, and a digital voice assistant will prompt you to select them on your device. The charging case provides multiple charges for the earbuds while one full charge will give you up to five hours of playtime. These earbuds have inbuilt mics on both the left and right ear. This means none of the earbuds will be slaving with music while the other picks up your calls. It also indicates that you don’t have to wear both earbuds at the same time. With the help of four-microphone technology, the earbuds can filter out the noise so the ambient noise in your environment will not drown your voice. They will come in handy when using them for runs or walks in windy areas. You can easily play and pause audio using a single press located on the right earbud. And to skip music or adjust the volume, you will be using the nubs on the left earbud for controls. We do like that it has a HearThrough function that you can play with when you want to listen to music and still know what is happening around you. The earbuds can integrate with Siri, Amazon Alexa, and Google Now. This way, you will have the virtual assistant of your choice. Customize the way you listen to music with the Jabra Sound+ app. It gives you access to the sound Equalizer to help you create a unique sound. The range is exceptional on these earbuds. You don’t need to worry about audio snags in busy streets except in the subway where there’s always bound to be interference even with regular making of phone calls. These earbuds have an IP55 rating. They can resist water, dust, and sweat. This does not mean you can take them swimming or use them in the shower. They are not sealed completely which indicates the inner components can easily get damaged when exposed to high levels of moisture. You can expect good sound quality with the Jabra Elite 65t. The highs are crisp while the mids are clear and complemented by a rich bass. If you listen to genres that are demanding on the bass like hip-hop and pop, you will love their sound quality. The Dash Pro Wireless Earbuds are packed with hi-tech features perhaps to warrant the high price. But the sound is by one of the best thanks to the Knowles True wireless balanced Armature speakers. Listening to music with them favors rock and classic fans because the bass is not on the high side making it much easier to hear a perfect blend of the voice and the instruments. Since the earbuds create a complete seal with the ears, the sound seems more immersive and improved. These earbuds host a ton of features. First, they come with 4Gb of internal storage where you can store up to 1000 songs, so you don’t have to pair them all the time. They can integrate with Alexa which allows for voice commands. The Dash Pro seems like it has come from the future. With a 4D menu on The Dash Pro App, you will be able to make selections using head gestures. It makes it effortless to interact with Alexa and the music player. The earbuds have in-ear biometric sensors that help track your activity. It applies to fitness activities as Bragi’s A.I will start monitoring without tapping onto anything. You can track running, cycling and swimming activity. This counts for your heart rate, distance, cadence, step count, breaths, etc. With an IPX7 rating, this model is waterproof to 1 meter for 30 minutes. What’s more, it can integrate with the iTranslate app to help translate up to 40 languages. The only way this integration works is if both of you are using the Dash Pro earbuds. One snag that keeps coming up with these earbuds is the loss of connection. Even when your phone is in your backpack, they will find a way of disconnecting which is not what you want when the sole purpose of having these earbuds is listening to audio without cables. 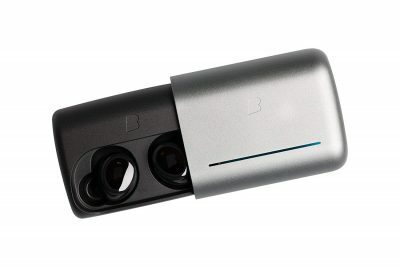 Bragi’s Dash Pro has a lot going for them regarding the sound quality, controls, noise isolation, and tech features. All these specs make them more than regular wireless earbuds that only play audio and answer calls. The software will still need more improvement, but Bragi has done a great job to improve the performance of these earbuds. Do your earphones always fall out when you shake your head or worse still when you attempt a single workout? 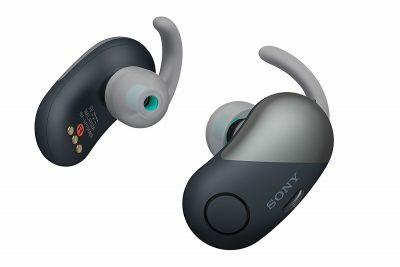 The Sony WF-SP00N/B are unlike regular wireless earbuds. From running to rock climbing, these earbuds will stay in your ears thanks to the silicon support fitting that sits in the ear. The earbuds come in four different sizes. You will be able to choose the ones that sit right in your ears to give a secure fit. This brand uses digital noise cancelation to help you focus on your activity while noises from your environment will never get into your ears. They also have the ambient noise mode that blends ambient noise and music so that you can hear your environment while partaking in your favorite activities. These earbuds have an IPX4 rating. They use a protection material that keeps out water splashes and sweat from going near the internal circuitry. They are a perfect addition for running and working out. Connecting these earbuds to your phones has been made easy using NFC technology. You just have all selected NFC compatible devices for minimal interference connection. You will also be answering calls hands-free thanks to the inbuilt mic. Sony WF-SP700N/B has a three-hour playtime on a full charge. You will get two more charges using the charging case which makes it a total of 9 hours of battery life. You can keep listening to music, podcasts, and audiobooks for a day without worrying about a dead battery. These earbuds are compatible with Google Assistant and Siri. You can have your questions answered, and get help without stopping strangers. Audio syncing when streaming videos is not great with these earbuds. You may not be able to enjoy watching movies on YouTube or Netflix because of the slight audio lag. The extra bass is also a snag as it inhibits music clarity in electronic music genres. The Sony WF-SP700N/B is made for intense activity. It is truly wireless, and a has a high water resistant rating to keep them in good working condition. The quality and sound quality all blend to give you high-performing true wireless earbuds. The BeatsX Wireless Earbuds offers personalized comfort and superior performance. As a subsidiary of Apple, the BeatsX also have a W1 chip that makes it easy and seamless to connect with Apple devices. BeatsX are designed to be comfortable neck earbuds. They fit super easy to your ears using two rubberized in-ear tips. They sit neatly in the ears such that they will not make your ears ache after a few hours of wearing them. You will like that these earphones have a flexible fit to provide all day wearing. You can hang them casually around your neck when you want to do stuff like tying shoelaces. And since they are magnetized, you can pin them together to make a pendant. With the carrying case, they store neatly for simple access wherever you are. The battery life on these earbuds is just incredible. They give you 8 hours of playtime which translates to a full day of interrupted music and listening to your favorite audiobooks. They also support fast fuel technology that allows charging the earbuds for five minutes, and you get two hours of playtime. Complemented by the 8mm drivers, they provide stereo sound with rich bass and balanced mids and highs. These earbuds use the RemoteTalk function to pick calls. It gives you control for your calls at your fingertips. You will love the Siri compatibility as it comes in handy when you want to make voice commands to control your music or have or your requests answered. For workout purposes, these earbuds are water resistant. They can withstand moisture like sweat but cannot be immersed. BeatsX does not have a way of reducing the length of the cable. Most users who wear them while working out complain they are more susceptible to falling out when the cable is being bounced up and down unless you wear them in a crisscross manner. TBeatsX earbuds are a cheaper version of the Apple AirPods. They are of good quality, the sound is remarkable, and they do not lose connection with the paired device. They pair with iOS, Apple Watch OS3, MacOS Sierra, making them useful over a variety of devices. Bose QuietControl 30 Wireless Earbuds are a piece of work when it comes to their noise technology. Although explored by many companies, no model has been able to perfect noise cancelation like Bose. This means you will enjoy the natural sound produced by these earbuds. The earbuds allow you to control how much noise you want to hear. You can bring it all the way to the maximum when you want to block out all noise and listen only to audio. This setting will work best when you have nothing in your environment to be aware of like the office. But if you are running in the streets, it’s important to listen to traffic, and that is where some level of ambient noise is applicable. These earbuds pair via Bluetooth and are NFC-enabled. It is one of the simplest ways to pair with devices as it only needs selecting an NFC-compatible device and you can listen with minimal interferences in crowded places. Bose QuietControl 30 uses an ergonomic neckband. It is a lightweight design that will sit comfortably around your neck. You will like the minimal look as it prevents these earbuds from standing out. The semi-open ear tips come in three sizes and do not need to be jammed into the ear. But because of this they risk falling out when you run. These earbuds will allow you to pick calls using the dual microphone that has a noise-isolation system. Even in windy environments, these earbuds claim to block out most of the noise, and users have also attested to this fact. Be in control of your earbuds with the Bose Connect app. The app is a thoughtful way of switching between devices and personalize your settings. The app also lets you see the battery capacity, so you are never caught with a dead one. What we like most is the battery life that is up to 10 hours with one charge. Although it will take 3 hours to recharge them, you will like the convenience they bring if you go for long hours at the office and need a constant companion. These earbuds do not offer a wired option that allows plugging into an in-flight entertainment system. They are good as regular everyday earbuds and not much for working out because they are not entirely waterproof. Stay Hear + QC tips. Bose is always a top pick in earbuds, and the QuietControl 30 is no exception. With its outstanding noise control technology, they are an easy choice for noisy environments. Mpow Flame Bluetooth Earbuds pass for dirt cheap earbuds that are actually functional. It is amazing all the features these earbuds carry for such a low price. First, these earbuds are IPX7 rated. They are perfect for working out if you usually work a sweat that can soak the tips. You can also run with them in the rain, but you can’t swim with them because Bluetooth connection will be lost when you are in the water. The Nano coating provides the waterproofing you need for all your outdoor activities. These earbuds aim at giving you the most comfortable time while wearing them. They have ear hooks to keep them in place, and they use memory foam tips. They will adapt to your ears such that they can seal in your ear subsequently providing noise isolation. You will appreciate that they have a cord clip to allow fastening them at the back of your head to provide an overall snug fit. The sound quality may not be the best, but Mpow has worked to provide rich sound that covers many sound genres. You will detect a bit of harshness in the highs, but other than that, they will be good company for your ears. With only 1½ hours of charging, the earbuds will give you anywhere between seven and nine hours of playtime. They come with a cushioned EVA bag that will protect your earbuds in transit. You do not risk losing them in a crowded backpack where you could pull on them if they get tangled in keys or with your phone charger and wired earbuds. Sound quality while on a call suffers for the person at the end of the line because the earbuds do not cancel out the noise. You may find yourself competing with the wind and the other people speaking close to you. Mpow Flame Bluetooth Headphones are solid earbuds that come very cheap. Despite being cheap, they are not crappy when it comes to sound, range, comfort, and waterproofing. You will like them for the gym or when running outdoors. When you are on a budget, getting the best wireless earbuds can be a hassle. But Plantronics makes it easy for you with their BackBeat Fit Earbuds. They also feature a sports theme seeing that they are neck buds that are water resistant and sweat proof. 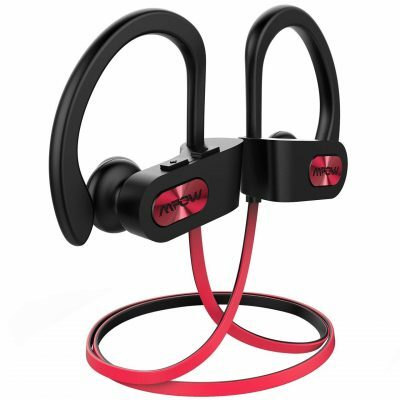 With a behind-the-ear design, these earbuds are more reliable to stay in the ears especially when you perform intense exercises that move your body like cardio and dancing. They have comfortable ear tips that will not press in your ears. They stay stabilized so you can use them for as long as you want. Control is at your fingertips with the on-ear controls that let you toggle music and answer calls effortlessly. The controls are easily accessible so it will be a natural process that will not distract you when you are counting reps at the gym. You will also get an armband that will store small stuff like your keys, or you can use it to keep the earbuds once you are done using them. These earbuds will never quit on you thanks to the 8-hour battery. And if you forget to charge them, charging them for fifteen minutes will get you an hour of playtime. They also come with powerful speakers that offer balanced bass crisp, clear mids, but the highs are a bit wanting. You can keep track of the battery life thanks to the on-screen battery meter display that will appear on your iPhone or iPad. Your Android phone also allows seeing the battery capacity by downloading the Plantronics Battery Meter app. 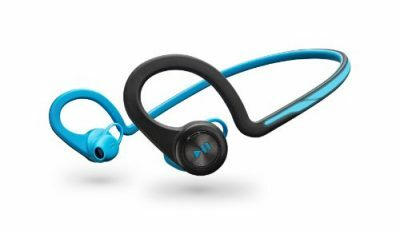 The Plantronics BackBeat Fit integrates with the PEAR Personal Coach app that will help you get through a workout and stay motivated. You will receive world-class coaching from renowned athletes and trainers. These earbuds come with an open earpiece design. It will be hard to listen to music with lots of background noise like in a busy street, amidst bus noise, or the subway. 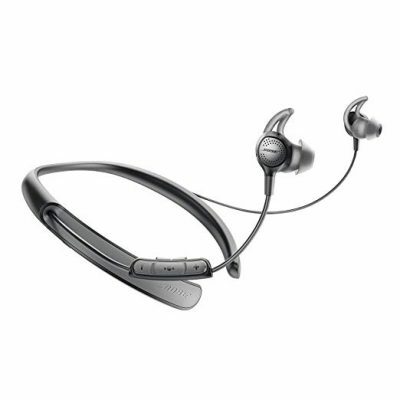 The Plantronics BackBeat Fit look the part in being reliable for working out. They have solid connectivity and an ergonomic design that will stay put in your ears for extended periods without hurting your ears. For the price, you can rest assured that you are getting an excellent product. 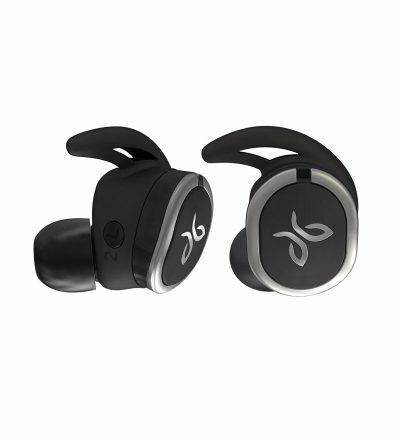 You can already tell that the Jaybird RUN True Wireless Headphones are for running. Designed with a comfortable in-ear design, these earbuds will stay put through the most intense sprints and hurdles. These earbuds have no wire to connect them. They are ultralight so that you will never feel their weight. Your focus is perfected as the earbuds come with fittings that keep them in place at all times. Jaybird RUN has been furnished with different-sized fins and tips. You can, therefore, find the perfect fit for your ears. These earbuds boast powerful audio thanks to the mini drivers that provide natural stereo sound. They utilize passive noise cancellation by sealing the ears; thus improving the sound quality in the process. Jaybird RUN wants you to give your best that’s why worrying about the piece in your ears is the last thing you need to do. The earbuds have been waterproofed to withstand direct water splashes and tons of sweat. They can also handle dust and mud like a pro so expect them to accompany you through all outdoor activities. You get to customize sound using the Jaybird app that has an equalizer. You will be able to increase the bass or crank up the treble using the app. It will even help you to locate the earbuds when they get lost. These earbuds have 4 hours of battery life on one charge. But they are supplied with a charging case that provides an additional 8 hours of playtime. It also supports quick charge where a 5-minute charge can get you one hour of playtime. It is strange that there is no button to play the previous track on the earbuds. You only have the play/pause, next track, and access to a virtual assistant. It also comes with a chunky case that will easily stick out in your pants if you choose to carry them in your pocket. Jaybird RUN wireless earbuds will work right out of the box with minimal setup. They have an incredible build that will not stand in the way of performance. If you want earbuds that are subtle but with good sound quality, you can’t go wrong with this set. Sony has a reputation for going all out when creating their products. Although they missed a few things on the WF1000X/BM1, we can say the covered everything there is to is to every day wireless earbuds. With 6mm drivers, the sound quality can be said to be okay considering the small size of these earbuds. Little can be done for such a small footprint, that’s why you should expect clear sound but not that great at the highest volume. The digital noise canceling technology truly warrants the high price. This is because you do not need to do a thing about the background noise because the earbuds will automatically adjust the sound according to the background. This means you can lose yourself in music in an airport and listen to an important announcement in a low-noise environment. If you want to customize the noise and sound preferences, the Sony Headsets Connect app will help you do precisely that. You will be able to adjust the lows, mids, and highs according to your listening preferences as it also acts as an Equalizer. These earbuds give you hands-free calls without any interference from background noise. When your phone is on a flat surface away from you, it maintains a secure connection so you won’t get disconnected mid-call. We like that these earbuds automatically power off when they are not in use to preserve the battery. You will get 3 hours of playtime with one charge and a total of 9 hours when used with the carrying case. These earbuds cannot be used one at a time. Both earbuds have to be in range so if you were thinking of charging one and using the other, they will not serve your purpose. The earbuds are also not sweat proof. 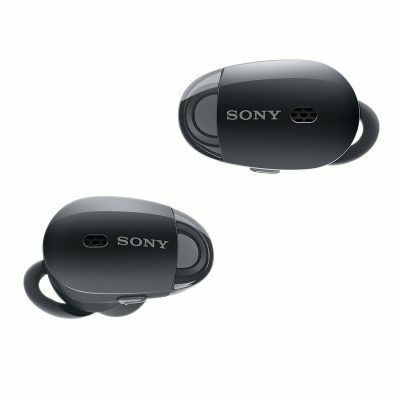 Sony WF1000X/BM1 are minimalistic wireless earbuds designed for use every day. Their digital noise cancellation technology puts them at the top of other earbuds in its price range. They have lots of features going for them especially the comfortable tips that will give you a reason to use them every day. That’s it, folks!! This list says it all on the Best Truly Wireless and Wireless Earbuds. We hope it is enlightening as we have narrowed down to the features that distinguish these models from the rest in the market.